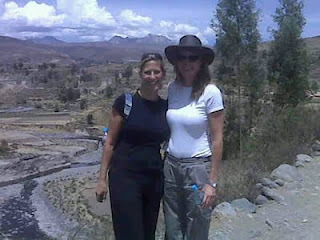 No doubt, Machu Picchu is a must see when in Peru but if you don't take time to explore other regions of this fascinating country--like the Colca Canyon (where I'm pictured w/friend Samantha Steckbeck)--you are truly missing out! My first (and surely not last) visit to Peru was a study in a whole different world--one where locals work & live off the land, and where a form of simplicity we never see in the States still exists. Sure, the city of Lima--where our journey began--is a bustling, growing city. But like any major city it's one of extremes...from the upscale residentials areas like Miraflores to the poorer ethnic neighborhoods. Despite the contrasts, the city is a beautiful one--bordering the Pacific Ocean and boasting its unique architectural style. And, there's no denying that Lima well deserves its moniker the "Food Capital of Peru." The sophistication of the award-winning chefs (Nobu Matsuhisa is half Peruvian!) coupled with the diversity and quality of the food--most freshly grown--is just amazing. Lima's definitely on my list of cities to return to, and recently renovated, all-suite oceanview Miraflores Park Hotel is certainly where I'll stay again (hey, if it's good enough for Depeche Mode, whose bandmembers were in house the night we arrived, it's surely good enough for me!). From Lima, a short LAN flight took us to Cuzco, the historic capital of the Inca Empire located in southeastern Peru near the Sacred Valley of the Andes. At 11,000 feet, the World Heritage Site's altitude is not for the faint of heart (be sure to book an oxygen-enriched room at the 16th century monastery-turned-Hotel Monasterio). Highly recommend spending a day here adjusting (and sipping coca tea) before taking the famous Hiram Bingham train to Machu Picchu for the day (or night, should you desire to enjoy the setting sans tourists late eve or early morning). The train ride is just over 3 hours, and includes a meal, drinks and entertainment each way. Should you opt to spend the night, the Orient-Express Hotels-run Sanctuary Lodge is the obvious place to do so. Next time I visit I'll stay the night for sure, if only to have time to join the outdoor yoga class (complete with Machu Picchu views!). Be sure to leave atleast three or more nights at the end of your trip to experience Peru at its finest & most authentic in the Colca Canyon. One of the most visually stunning destinations I've encountered in my travels, Colca Canyon in the Andes is one of the deepest canyons in the world at 10,725 feet. Las Casitas Del Colca, now topping my list of all-time favorite hotels, is well worth the three-hour drive from the "White City" of Arequipa for its luxurious private casitas (each with backyard terrace/plunge pool, outdoor showers and incredible views--not to mention, frequent visits from the live-in llamas!) and the unbelievable food (most of it grown right on property under the watchful eye of fabulous General Manager Cesar Torres). A visit to hotel's gorgeous Spa Samay for a massage with Giovanna is a must, as is an early wake up call for the hour-long scenic drive to witness the Cross of the Condors. Other than that, nothing is mandatory in this part of the world where it's commonplace to see donkeys and alpaca crossing the roads, families working in the farms and local childrens greeting you with a sonrisa (smile). Other Peru tips: Drink a few Pisco Sours (the signature drink of Peru), enjoy the fresh local cuisine, and be sure to stop in at the local markets (especially in Cuzco) to pick up hand-knit alpaca scarves, hats & sweaters (I scored a gorgeous sweater for only $10!). Chat with the locals (in Spanish if you can) and be sure to book plenty of downtime at each of the fabulous Orient-Express hotels mentioned above. At Las Casitas, optional activities include horseback riding, cooking lessons & baby Alpaca feedings! A full Peruvian itinerary can be easily arranged through Orient-Express' Peru Experiences, complete with amazing private guided tours (it's a must to schedule these with my personal favorite tour guide Jack Bytton). One of only 2,500 Jewish people in Peru, Bytton (who lived in the States & worked as a guide at New York City's Holocaust Museum) has an infectious personality and a passion for showing every one of his guests the BEST OF PERU. The South American country is one I cannot wait to visit again, and highly recommend you too will add it to your list of destinations you MUST VISIT SOON. The best way to travel to and from Peru, of course, is on LAN. The comfy business class seats with lie-flat bed capabilityare among the best in the sky, and the airline's entertainment system tops all others for variety & quality of movie/tv/music choices. Nonstop flights from both coasts with convenient departure/arrival times are another bonus! For more details, or to plan your visit to Peru, please contact us at 310.979.9036 or via email at elitetravelgal@gmail.com.